Kabukicho Matsuri (歌舞伎町まつり) is the last Bon Odori Matsuri in Tokyo. 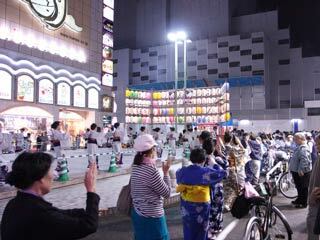 It happens in the middle of Kabukicho in early October. There is a dance demonstration between Bon Odori break time. The security of Kabukicho is very poor. Don't visit this Bon Odori with kids.